This is long overdue. The end of term, family visiting, start of summer vacation…and visiting other Canadian cities interrupted the usual routine of things. Visiting Toronto was on our to do list since we’ve lived here, and this Summer we decided was the time to go. It took us this long to save up air miles to pay for some of the attractions and to pluck up the courage to drive so far. To put it into perspective, our longest journey in the car with the children was a time we headed off to the French Alps from Worthing, West Sussex in the UK a few summers ago. We left after our church Sunday morning meeting, so early afternoon, driving via the Eurotunnel and then onwards to the Alps. We arrived in the early hours of Monday morning. That distance was roughly half that of Fredericton to Toronto. and that distance is still not even a third of the way across Canada. This country is huge. Anyway, in for a penny in for a pound (or is should that be ‘in for a cent in for a dollar’? ), we decided to pack in as much as possible, visiting Quebec City on the way and Ottawa on the way back, breaking the journey up a bit both ways and seeing as much of the sights of Toronto as we could pack in. We were one family member short as our son works at camp during the summer so it was Tim and the girls on this trip. On a wet Friday afternoon, we left Fredericton for our adventure. 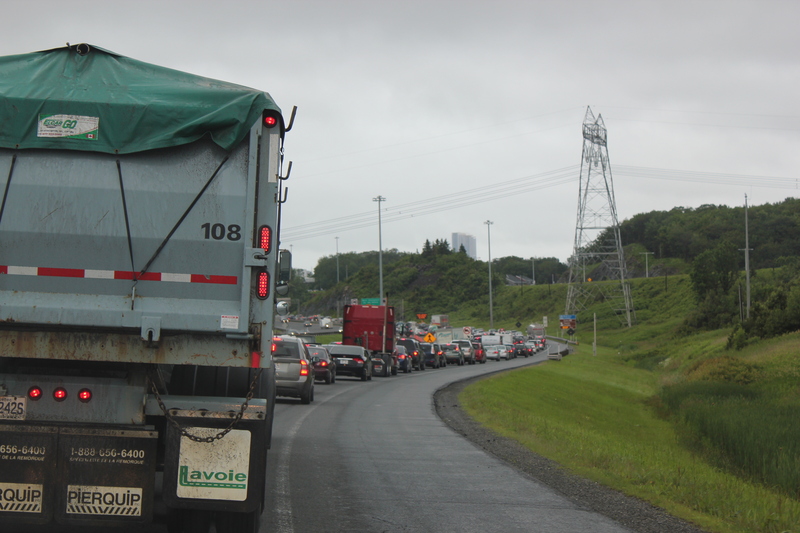 We hoped that it would brighten up by the time we got to Quebec, but the rain just rained heavier on that first leg. Five and a half hours of rain and then, behold, something we hadn’t experienced for a long time. We have a knack for hitting places at rush hour. This was the queue for the bridge. It wasn’t too bad. The biggest challenge on a journey for Tim and I is five minutes before we get to our destination. This is when an argument is most likely to happen, usually over directions and who said or did what. This time we managed okay, checking in to our hotel with not a little relief. Promising our girls that we would be back in time for a swim in the pool, we convinced them to come on a walk to the old city, a mere 20 minutes from our hotel. The girls decided that Quebec City was a bit scary. I don’t think it is, I think they are so used to being in quiet and friendly little Fredericton that a big city has become a more daunting place. In spite of the wind and rain it was lovely to see the old buildings and narrow streets of Old Quebec. I’d like to return there on a sunnier day to mooch around all those quaint streets. 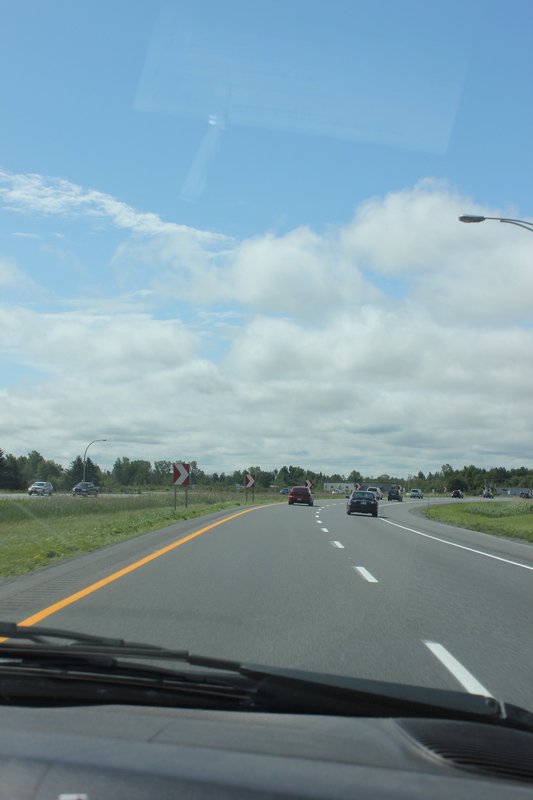 And so the next morning we journeyed onwards, still in the rain until a little way outside Montreal. We stopped off with much excitement at Ikea in Boucherville. Our nearest Canadian Ikea to Fredericton. Saturday lunch time is not the best time though. All that old Ikea stress came back quite quickly – you know, when you’ve trailed through the showroom and then the marketplace, then you find one of you has to go back to the kitchen department to inquire about something while everyone else waits by the check outs. Watching people coming round the corner willing it to be the person you’re waiting for. In the end, we didn’t buy anything apart from hotdogs. Interestingly, Ikea was the only place in Quebec province where daughter number two had to translate for us. Everywhere else when I spoke in French, English was spoken back to me. Onwards! We managed to get through Montreal without getting lost and soon we were in Ontario. Yay! Nearly there. No, not at all, still hundreds of kilometres to go. The journey went on to cruise control with frequent stops at ‘On route’ service stations for the wash room or for fuel. I got excited when we got glimpses of Lake Ontario and tried not to look at where we were on the map too often. 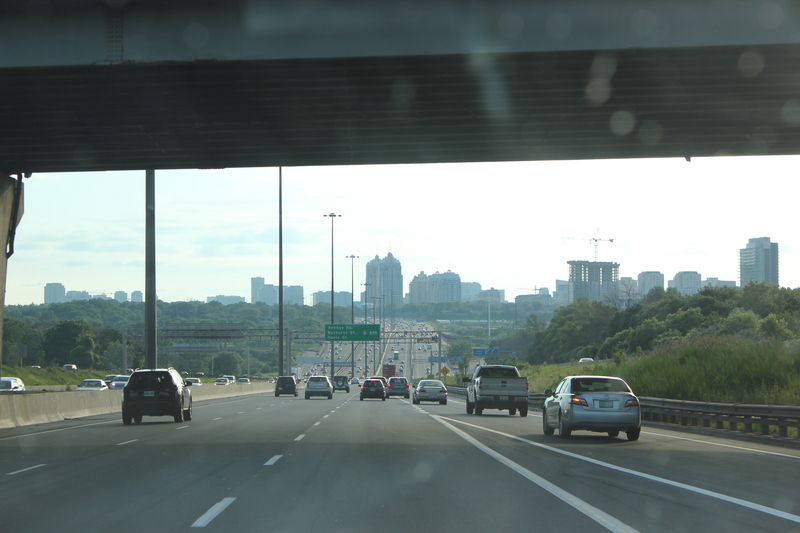 Needless to say after hundreds of kilometres of not too much to look at, driving into Toronto caused much excitement. Thankfully, on a Saturday on Canada Day weekend the traffic moves quickly along the 401 so we zoomed through and then had to head north to Alliston where we were staying. We did miss our turning off that 401 express and had a little meandering to do, but we made it. We managed not to argue though we were all tired and hungry. This made seeing friends at the end of the journey all the more special. We ate late night pizza and chatted with Jeremy and Melanie and their children around a fire in their garden. We headed to our home for the week – a little apartment above Melanie’s parents garage for the week that they’d kindly lent us. We’d made it. Now I could go through all our day trips in the Toronto area, but I think it might be too much. The things I’ll remember is the drive into Toronto from Alliston, heading from the quiet town to the big city each day and the relief to head back there. The sound of the train running through Alliston a few times each night, bells ringing and horns blaring. The quiet streets of Toronto during Canada Day weekend contrasted to the weekdays – so many cars and so much construction on all the roads. Nuts! Public transport would be wiser. The girls’ interest in the animals at the zoo and the fun at Canada’s Wonderland. The tranquility of the Casa Loma, a castle in the middle of Toronto. Seeing Niagara Falls…Anyway here are some highlights. Vertigo starting to kick in. On the Maid of the Mist. On the way back we stopped in Ottawa and celebrated our youngest’s tenth birthday. It was a steaming hot day or so, but we wandered round and saw some of the sights of the nation’s capital, before the long road home. So our road trip is done. I think we’re initiated into Canadian style long distance holidays. It was a great time, where the odd moany moment was swallowed up with the thrill of being somewhere different. Like any family holiday really. Where we’ll travel next time we’ll have to wait and see…maybe on a plane?